The Sunbeam Silver Bullet was the last attempt on the land speed record by Sunbeam of Wolverhampton. It was built in 1929 for Kaye Don. Powered by two supercharged aero-engines of 24 litres each, it looked impressive but failed to achieve any records. Sunbeam's 1927 200 mph land speed record won with the Sunbeam 1000HP had been broken by 1929, and the company decided to build a car capable of reaching 250 mph (400 km/h) so as to recover it. Only aero engines offered enough power to do this, and such a car would also provide a test bed for developing a new generation of Sunbeam aero-engines. Sunbeam decided to develop a new aero engine of 2,000 hp (1,500 kW), and the car would be powered by two of them. This new engine was a water-cooled V-12 with a 50° angle between the banks. Ideal balance usually favours an angle of 60°, but this choice made the engine narrower overall. Cylinder bore was 140 mm (5.5 in) and stroke was 130 mm (5.1 in), for a capacity of 24.02 litres.This oversquare geometry was a first for Sunbeam, but encouraged a high-revving and thus more powerful engine. The engines were supercharged, using a large centrifugal blower, geared to 17,000 rpm. 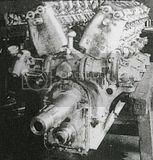 This was increasingly common aero engine practice of the time, in both the Napier Lion and the Rolls-Royce R-type, but again was a first for Sunbeam. When installed in the record-attempt car the engines had an unusual cooling system using melting ice rather than a radiator. This avoided the drag of an open radiator, but obviously could only cool for as long as the ice lasted. It was a workable system for land speed records, used by the contemporary Golden Arrow and more recently by the JCB Dieselmax. Silver Bullet had an 11.5 cu.ft ice tank, filled with 5.5 cwt of ice before each run, and a one gallon mixing tank in the nose. Photographs of the car are rare, although there are some at the Brooklands photo archive. These show it outside Delaney & Sons. garage, a popular location for racing in this era. Some also show close-ups, including the innovative rear aerofoil that could be adjusted to generate downforce. Competition for the land speed record in between Segrave's Golden Arrow and Malcolm Campbell's new Blue Bird was fierce, so the car was built quickly, working around the clock in shifts. This left little time for thorough static testing of the engines, made even worse as only two engines were ever built and so the only engines available for testing were the race engines themselves. Silver Bullet first appeared in public on 21st February 1930. Following the other teams, the first record attempt was to be made on Daytona Beach, in Florida, with Kaye Don driving. The car arrived at Daytona on the 8th March and Louis Coatalen himself on 16th. The record attempts went poorly though, with engine reliability problems and the car proving difficult to control. The fastest speed attained was 186 mph (299 km/h), well below Sunbeam's own record of three years earlier. After the team returned home, further attempts were made to improve the car with testing on Pendine Sands. Sunbeam aircraft engines had never recovered from the financial effects of the end of the Great War. Coupled with the Depression of the 1930s, Sunbeam simply could not afford a competition program of this scale. Although other UK car companies even did well in this period, Sunbeam did not and went into receivership in 1935. The Silver Bullet was sold to Jack Field, a Southport hotelier and garage owner. He tested the car on Southport beach, scene of Segrave's earlier success with the Sunbeam Tiger, but couldn't solve its problems and eventually the car was scrapped. One of the interesting things about this car (other than it couldn't set the record) was built into the vertical tail stabilizers was also a horizontal wing that could pivot up to be used as an air brake. Here is a picture of the car minus the body so you can see the two engine layout. The supercharger was driven at the front engine and fed both motors. The single blower feeding the two engines was likely the biggest problem with the car not achieving the record. It caused massive backfires due to fuel distribution problems. Here is what happened from one such backfire. In June 1929 Coatalen’s thoughts again turned to recapturing the world land speed record. Segrave’s original record set in 1927 had only lasted for 11 months, as it was beaten by his arch rival Malcolm Campbell in February 1928. Campbell’s record soon fell to Ray Keech, an American. In March 1929 Segrave was back at Daytona with his very futuristic Irving-Napier Golden Arrow. He easily broke Keech’s record at an amazing 231.446m.p.h. and was subsequently knighted for the achievement. All of this must have been on Coatalen’s mind when he summoned Sunbeam’s chief designer Hugh Rose to Paris to receive a set of drawings for a new land speed record contender. Kaye Don was engaged to drive the car which would be known as the “Silver Bullet”. The car was powered by two specially designed 12 cylinder, 24litre lightweight engines, each capable of developing 490b.hp. at 2,400r.p.m. Each V12 engine weighed less than 1,000lbs and had an angle of only 50 degrees for the V to keep the engine as compact as possible. The front engine drove the water and oil pumps, and the rear engine drove the supercharger. They were started by compressed air and cooled in a strange way. The car had an ice tank which would be filled with 5½cwt. of ice on each run. Water was pumped through each engine block and re-circulated via the ice tank and a mixing tank. Pedal operated brakes were used and everything was housed in a light aluminium body with an overall length of 30feet, a width of just 3feet and a height of only 3feet 8inches. The car weighed in at about 4½ tons. By mid November the engines and transmission had been fitted into the chassis and tested at the works. The car’s first public appearance was at the works during a reception given by Louis Coatalen and Kaye Don on 21st February, 1930. C. B. Kay, the Production Manager, Hugh Rose, the designer, and many of the men who built the car. On the 26th February the car left Southampton, bound for New York. On board the ship were Kaye Don, his sister Mrs. Rita Livesey, Henry Wilding, who was in charge of the car, and a team of 5 mechanics. The car arrived at Daytona on March 8th and preparation work quickly got underway. Unfortunately there were too many teething troubles including a fire problem, and after 18 unsuccessful runs and much work on the car, the record attempt was abandoned. The team returned to the UK on 22nd April, but all had not been lost as the car set an American record for the flying 5 miles of 151.623m.p.h. on March 18th. This was an end to Sunbeam’s land speed record attempts. The “Silver Bullet” was sold to Jack Field, a Southport hotelier and garage owner. He unsuccessfully attempted to solve the car’s problems, and after much effort it was eventually scrapped. The general arrangement of the Silver Bullet. From The Automobile Engineer, June 1930. One of the engines, showing the 50 degree V.
The complete chassis is wheeled around the works. Another view of the car at the works, before the body was fitted. Kaye Don and the car at the works. A rear view of the car showing the air resistance brake between the tail fins. The car is shown to the press. The Silver Bullet and some of the men who built her. The final ceremony at the works before the car is put into the enormous crate on the far left. The crate is loaded onto the lorry to begin its long journey. On its arrival at Daytona the car attracted a lot of attention. Kaye Don and the car on Daytona Beach. At speed on the beach. The Silver Bullet on fire. British racing driver Kaye Don and his new racing car the Silver Bullet at Wolverhampton, England on February 21, 1930. March 27th, 1930: Kaye Don takes the Sunbeam Silver Bullet on a trial run at Daytona Beach, Florida. Powered by two supercharged engines of 24 litres each, the car failed to achieve any records.